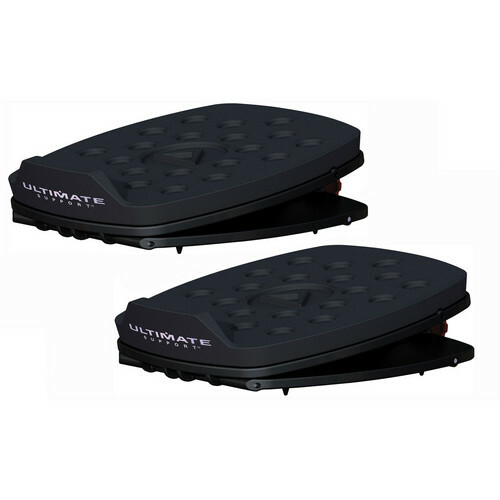 The MS-80 Desktop Studio Monitor Stand (Pair) from Ultimate Support provides exceptional strength and durability for home, studio, or professional use. The stand features non-slip, high-density foam, and an angle-adjustable base to fine tune the listening sweet spot. Each stand has a load capacity of 75 pounds to accommodate a variety of monitor speakers. In order to ensure the best sonic isolation and decoupling, each stand has acoustic foam and stabilizing pads on top, 2 rubber couplers between the column and the top/bottom plates, and spike decoupling designs under the top and bottom base plates. Box Dimensions (LxWxH) 14.15 x 10.75 x 5.1"
MS-80 Desktop Studio Monitor Stand (Pair) is rated 4.5 out of 5 by 2. Rated 5 out of 5 by Anonymous from Awesome for my needs Hello treble!! I had to had this since my RTA workstation had my VXT8s at a height which didnt allow the tweeters to be heard. MS90 works as advertised! Is B&amp;H selling the newer version of this item which is MS-80B?